This class is appropriate for adults of any age, including seniors and those looking for a gentle introduction to yoga. The class is structured around rejuvenating the body… including stretches, breathing techniques, attention to alignment, meditation and deep relaxation. Gentle yoga practice helps develop greater flexibility and can be effective in preventing and slowing bone density loss. 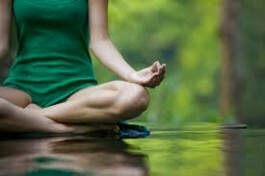 Regular mindfulness meditation practice can help relieve stress and stay centered, and energized. For those with knee and wrist issues that deter them from practising certain postures from the floor, this gentle yoga class can be done partially from a seated position and using chairs as props. For more information please call Louise on the number above.